Crossing the line between life and death has never been so frightening. Having a soul separate from its body is not only a threat, but it is also unsettling experience that touches on faith and the idea of magic going too far. 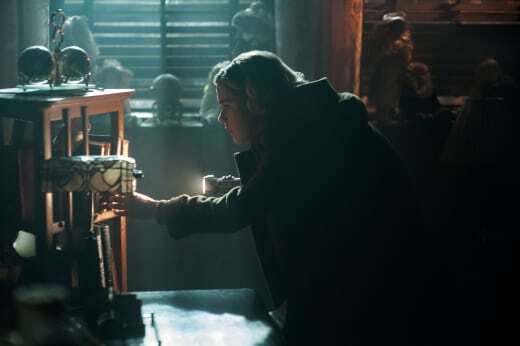 During Chilling Adventures of Sabrina Season 1 Episode 8 and Chilling Adventures of Sabrina Season 1 Episode 9, Harvey’s brother is killed in the mines but Sabrina decides to recruit the Weird Sisters to resurrect him to disastrous results. She ends up putting two lives at risk, forcing Harvey to do something he can’t come back from. Meanwhile, Ambrose gets his chance at freedom but ends in a possibly strange situation working for Father Blackwood. Roz gets more aware of her visions, all while Madam Satan gets the last part of her plan prepared. “Chapter Eight: The Burial,” written by Lindsay Calhoon & Christianne Hedtke and “Chapter Nine: The Returned Man,” written by Axelle Carolyn & Christina Ham were as emotionally charged as they were character driven. The plot moved forward because the characters made that happen, a definition of a successful turn of events for a show. But what stood out in both episodes was the way the high impact that came from characters just talking. Sabrina and Harvey, Sabrina and Zelda, even Ambrose talking to Sabrina in the mortuary were what made it all stand out. The main concern that Sabrina had about her birthday came from the idea that she would be forced by the Dark Lord to commit acts she wasn’t okay with. Sabrina embraced darkness, but it had to be on her own terms. And now, Sabrina got exactly that and ended up risking her relationships with just about everyone around her. Knowing that Madam Satan is pulling all the strings makes the parallel of where Sabrina was at during Chilling Adventures of Sabrina Season 1 Episode 1 and where she is now even more clear. Madam Satan is pushing Sabrina to make choices she never would have considered before, allowing her love for Harvey and her friends sponsor it. There is nothing Sabrina wouldn’t do for the people that she loves, something you can’t not love her for. But the show and specifically the villains in it use that trait to define their own sinister agendas, which is where this cursed decision came in. It was horrible what happened to Tommy, and it wasn’t right for The Weird Sisters to do that. But they were in the wrong and Sabrina trying to undo death was where she pushed herself too far. The way that she killing Agatha because she was certain everything would be okay and how blindly she tried to get Tommy’s soul back was a new version of the lead that we have grown with a bit already. Sabrina can be spontaneous but she always thought about the long game, something she didn’t do here. It was a brilliant plan on Madam Satan’s side, forcing Sabrina to do something she never would have before, but that seemed so obvious to her because of the reasoning. The way that she has faced off against all of this brings her closer and closer to the person that fits The Church of Night. Permalink: There’s no fixing it, Sabrina. You’ve opened Pandora’s Box. Everything that Sabrina was worried about happening if she signed away her name has already happened, and she hasn’t even realized it. This was a character decision that pushes Sabrina to the edge, what comes after this fits perfectly against the assumption that the Dark Lord is returning to get what he wanted all along. Sabrina is in a different headspace than she was originally, and she almost has no leg to stand out to make her case for not signing her name over. She has crossed lines that now make her a chilling example of what the Dark Lord wanted of her all along. It also can’t be denied that Sabrina enjoyed the ritual, even if only for a second. The aftermath of it was heartbreaking, but at that moment she looked in power as she was performing the resurrection. Sabrina was doing it for Harvey, and yet it appears like she found something from it as well. It is ironic that Harvey started out thinking that by leaving his brother he killed him, only for Sabrina’s attempt at a good dead to actually force him to murder Tommy. This was building up for Harvey, there was no way that magic wouldn’t reach him especially with his family’s past. But this went from him considering something was going on, to being hit by a death and Sabrina’s reveal full force. A cathartic decision was made just in time though because with the finale approaching Harvey needed to be clued in. Drawing it out adds suspense, but it is also a time waster. Permalink: He said that his dream was that my dreams came true. Sabrina kept the secret from them long enough and they can’t be in the dark constantly. There becomes less for all the characters to be involved with because they aren’t aware of anything. Plus, in all this talk about development, the best way for Harvey to grow is to remove the wool over his eyes. He was fine in his happy place with Sabrina, but he deserved to know the truth instead of having her lie to him and having him be lied to. It was a lot to throw at him at once, but it shaped him in just a few days. Harvey already got more courage, something he struggled internally with this season. This experience was like dropping Harvey in the worst possible scenario and then allowing him to learn how to come back from it. Which is why it might hurt but Harvey asked for some space from Sabrina was a necessary choice. As mentioned before, Sabrina should have told Harvey sooner. The longer she waited, the worst it was going to get when she was forced to tell him the truth. Now Harvey is in a place where things can’t just work out. As much as they should, if only because of these two growing side by side, Sabrina went too far. And while it was in the name of Harvey, it doesn’t seem like something he wanted. Sabrina wanted to help and couldn’t figure out how, leaving Harvey with a scarier memory of his brother. Moving forward, Harvey needs to cope and he should figure out what he wants. It isn’t likely that he wants to remove himself from Sabrina completely, it is obvious that he still loves her. He has to see if he can forgive Sabrina and if from there they remain friends or more. There is also the question of magic, how much he wants to know and how much he might want to stay away from. This is a turning point for Harvey and this whole season was preparing him to make a decision. He is no longer a guy who spends time with his girlfriend and draws comics, the world got a lot more real and Harvey is ready to face it. The more Roz figures out her powers, the more clear it is to us that something is coming. And honestly, giving the human side of Greendale room to explore their place in the magical realm was genius. In the first half of the season, there was a clear divide between human and witch. That is fine when you have Sabrina at these crossroads of where she feels like she belongs because both seem like an option that doesn’t actually exist. Permalink: The witches are coming. Now though, Roz and Susie and Harvey have seen their fair share of possession and dark magic. Sabrina is muddling it up as well, allowing magic to intermingle with her human life when she feels like there is no other option. The line is no longer as clear, the separation is no longer as easy to keep up. It lets the characters from Greendale have bigger arcs and that is always a good thing. 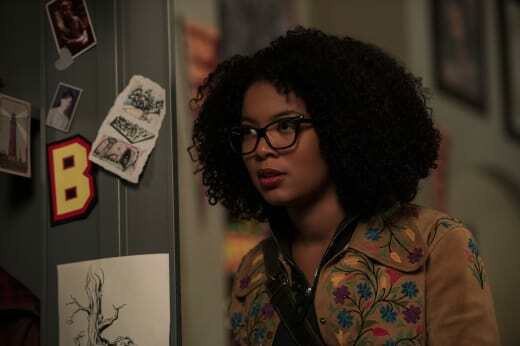 It also introduces the audience to more avenues of magic, not just a witch but to a potential witch hunter storyline in Harvey and a cunning oracle feature with Roz. Getting to see what Roz sees is another bonus, it is another version of events that we get to save in our minds for later. Roz seeing Tommy was different until it is shaped by Sabrina’s magic understanding. All in all, this was a great approach to bringing two sides of the story together instead of relying on them being apart. Roz is independently conquering this skill and paving for her own corner in the narrative, a journey that is even more interesting when Susie’s role in all this is factored in as well. Essentially, the human side is no longer just that. They aren’t defined as a group that didn’t deserve to be remembered, even if only by the audience who got small glimpses of their lives for a while. The mortals are making it their own, and it makes for a more creative path to the well-awaited finale. There is having connections and then there is whatever Luke is. His support of Father Blackwood is already suspicious because there is nothing good happening over there. Ambrose is getting everything he could have wanted but there is a price and he might be nearing it. Speaking of Father Blackwood, what is Zelda doing? I understand the devotion to your High Priest but that is taking it to the next level. It is a fascinating addition to the conversation of the way women grab back the power after first having it taken from them. Every scene Father Blackwood is in adds to the before part of this observation. Whatever Susie is involved in has me worried. Them talking that openly with a ghost can’t be good. Unless this is a Madam Satan inspired side effect that wasn’t made clear to us. Nick just really wants to be part of the Adventure Squad. The best-kept secret in all of Greendale is Madam Satan’s identity. She plays innocent so well as Sabrina plays right into her plans. Sabrina was so worried about the Dark Lord being a threat that she forgot to actually check to see if he was. We need to take a second and address the remarkable acting in this episode. The way that Zelda and Sabrina went at it, the way that Sabrina and Harvey handled the talk about everything that she hasn’t owned up to. All of it was some of the best acting within the series, specifically the way that it allowed the emotions to control the scene. What did you think of Sabrina’s action? Do you see where she was coming from? Was Harvey justified in being upset with her? Where do they go from here? Is Ambrose joining the academy a good idea? Does anyone have a clearer understanding of what Susie is going through? What did you think of Roz’s visions? How much do you love Salem? How epic was that ritual? 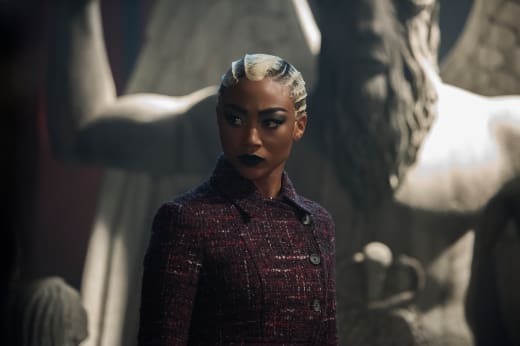 Don’t forget that you can watch Chilling Adventures of Sabrina online, right here on TV Fanatic.